Traveling for the first time with your significant other is truly an exciting yet challenging experience. Sure, there are endless opportunities for fun and romance, but when faced with foreign cities, unfamiliar cultures and travel mishaps, your romantic getaway can easily turn into a nightmare if you don’t prepare for it physically, mentally and emotionally. 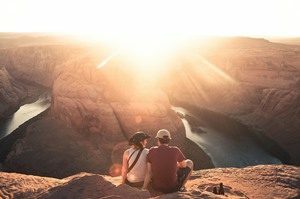 So if you are already planning your first trip together, make sure to keep these 6 essential tips in mind to make sure you come back as a couple and not as enemies. 1. Pick a destination that you are both interested in. I’m sure you have a list of places you want to visit someday, and your partner probably has one too. If not, then at least an idea in your mind of what you want the destination to offer. Take time to sit with your partner and discuss with each other your bucket lists and types of activities you are interested in. This way, it will be a lot easier to choose a destination that you both like. Your first trip together is a major deal, so make sure it’s something that you both will look forward to. 2. Plan the whole trip together. Once the destination’s set, it’s time for the planning stage – which both of you should be involved in, even if only one of you is the “natural planner.” Planning your trip together is important to avoid misunderstandings and to ensure that you have an itinerary that is agreed by both parties. You won’t always agree on each and every activity but you can always compromise. 3. Be open to trying out something new. Speaking of compromise, it’s imperative that both of you are willing to try something new because it’s not all the time that you will be able to find an activity that you will both like. Be open to trying out things that your partner is interested in, even if it’s a totally brand new experience for you – surely, this will bring you closer and will give you the chance to know each other more. 4. Agree on a budget beforehand and keep track of your finances during the trip. Money matters can be a deal breaker. So before embarking on your trip, make sure to talk about the finances. Remember, if you are the higher earner, you have to be sensitive to the partner who has the lower income. Decide on a budget that works for both of you and make sure to keep track of your expenses during the trip to avoid going off your budget which can be a cause of bickering. Take this opportunity to learn as much as you can about each other, including the flaws and the quirks. If you sense a problem or feel uneasy about something, don’t hesitate to speak up. Communicate openly instead of just pouting or doing the silent treatment in order to address the issue, before it’s too late. 6. Don’t forget some alone time. Of course you will be planning a series of romantic and fun activities together, but it’s also important to be able to spend some alone time during the trip – even if it’s just taking a walk while your sweetheart is at the spa. A short time apart will make you cherish your moments together even more. Give each other a chance to do things on your own and by the end of the day, you’ll surely miss each other more and you’ll both be looking forward to a romantic night together. In conclusion, traveling with your significant other for the first time can make or break your relationship. To avoid the latter, remember these tips by heart and take advantage of this romantic getaway to solidify your relationship. This entry was posted in Dating, Love and Marriage, Travel. Bookmark the permalink.